Fashion Architect: Fancy coming to Fashion Week Athens? Fancy coming to Fashion Week Athens? I know most of you wanted to hear all the details about my new job and even more after I said I would be holding it a secret for a while. Well, change of plans. I decided to spill the beans and tell all now: I work for neTWire, a web design firm in downtown Athens, and my job is running ermou.gr, an on-line guide about shopping in Ermou, the most famous market street in Athens. The reason I was holding out is that the site is getting a make-over really soon and I wanted to introduce you straight to the new, improved and fabulous site, when it would be ready. My job also includes writing about the shops and the fabulous new things one can find there in Ermou Magazine, the site's official blog. Why I had to tell now? Fashion Week Athens starts this weekend and here at the ermou.gr headquarters, we managed to acquire ten double invitations to the NEWCOMERS* SHOW, a group fashion show where the most up-and-coming hot names of young Greek fashion, (namely Dimitri Zafiriou, Dimitris Petrou and DELIGHT) will be showing their collections for fall/winter 2009-10. And here's the thing: You can win one of these ten double invitations, simply by leaving a comment on Ermou Magazine's last post here and stating what you would like us to write about. It's a win-win situation, really! If the comments are more than 10, my boss will hold a draw. I really hope some of my readers will get lucky, so if you're reading this and you can be in Technopolis, Athens on Sunday, March 29th at 10:30, go leave a comment now! 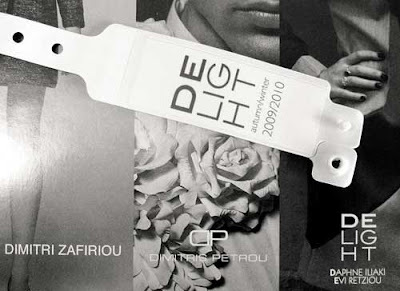 Second, I'd give my right arm to attend fashion week in Athens ... but sadly I need it for other stuff. Congratulations again! It would be neat to add Greece to my spring travel plans, but alas, it is not to be this year. :( Can't wait to read more about your new adventures! Wow, congratulations!!!!! Ακούγεται φοβερή δουλειά και σχετίζεται και με αυτό που αγαπάς τόσο πολύ...τη μόδα. Καλή επιτυχία!!! Man I wish I was in Athens right now! That job sounds fantastic and so perfect for you. Congrats! i wiiish i could be in greece for that! that would be awesome but unfortunatly i live half way across the world..
you said your job ivolved blogging, but I had no idea! congrats! hi!just stopped by to say(or better write?!) that you do a great job with this blog. also,congrats on your job,sounds like your style exactly! hey there!! apla na pw allo ena euxaristw gia ti prosklisi simera!! itan polu omorfa!! Fashion Week Athens, a bad start?